An official Nerd in the 'Noke logo was created by Josh Ginter of Blue Monkey Studios. I had been toying with the idea of a logo for quite a while and I couldn't be happier with what Josh came up with. Be sure to go check out his work! Nerd in the 'Noke got a visual re-design (I can't take credit for this, I just switched up the layout provided by blogger). 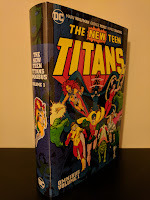 I expanded my content to include reviews of collected comic editions. This was a suggestion made to me probably 2-3 years ago by Terry Baucom, the owner of my local comic shop: B&D Comic Shop. If you're in the Roanoke, VA area be sure to give her a visit. I created a Nerd in the 'Noke Facebook page to help people follow updates, and a widget has been added to the blog. I joined Instagram and a widget was added to the blog. A Goodreads widget was also added to the blog. My hope is that this will help keep me on track with whatever I may be reading, but may be of interest to others as well. 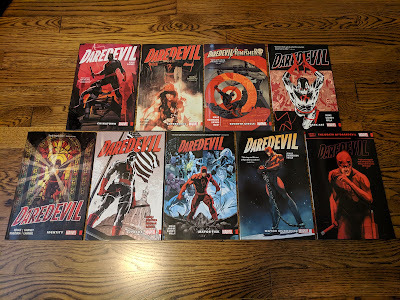 Last but certainly not least, I added a page for my Daredevil Collected Edition Reference. This was a project that I started shortly after dropping the part-time job and it quickly became much larger than I had originally anticipated. It is a massive Google Sheets spreadsheet, and I wanted a primary location the link could be found at for ease of sharing. 2017 also saw an overwhelming increase of traffic to the blog, which can be primarily attributed to a couple of online communities that I have joined and become more active in over the last year. 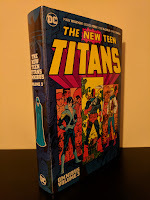 Many, many thanks to fellow members of the Omnibuds' Café and The Omnibus Collector's Comic Swap and Community (and Omniplex sub-group) Facebook groups*. You all provide a welcoming, all-inclusive, engaging, informative place to discuss our favorite interests. As soon as I began sharing links to my reviews with you all, traffic to the blog sky-rocketed and I can't thank you enough. This is just a hobby for me and I don't make any money off of page hits, so just seeing that you all have an interest in my thoughts is really cool. *For anyone interested in joining either of these groups, they are closed groups and may take a couple days for the admins to approve your request to join. Just be patient, they're very busy but will get to it! Well, I've rambled long enough. This was meant to be a quick 'Happy New Year!' post and it snowballed into this. Thanks again for checking out my little corner of the web. Here's to another year of enjoying comics, film, and whatever else you may be interested in.